Over the past week, my family has had the opportunity to listen to something new. 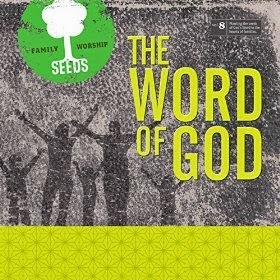 Seeds Family Worship just released a new album -- The Word of God. I have heard of Seeds Family Worship before. I've thrown some of their CDs into my wish list at places like ChristianBook.com, but I've never actually heard any of them. After listening to this CD, I want to go get volumes 1-7. Seeds Family Worship describes itself as a "music-based ministry that creates modern, relevant word-for-word scripture songs for families." The music is catchy and, oh, what's the word I'm looking for here? Current? Fits in with other music you hear today? Real? We pulled out our Bibles, and followed along with many of the verses, and while there were sometimes a couple little things that were different, and there would be the occasional "catch phrase" type of thing that repeats, yes, this does follow pretty word-for-word with the scriptures. This particularly CD includes scripture verses from both the Old and New Testaments, but there is more in the New Testament. The Old Testament includes Deuteronomy 6:4-7, Proverbs 31:30, and Psalm 119:9-11. Everything else is New Testament, and all of that is from the letters. My kids all like it. There was a request made that I play this CD while they wash dishes from now on. It only took a single listen before they were singing along to at least parts of some of the songs. And the kids immediately recognized Matthew West, who performs the second track, Your Life is Hidden (Colossians 3:2-3). The really great part? When you purchase from Seeds Family Worship, you get TWO CDs. One for you. One to use to give away and plant seeds somewhere else. This doesn't feel like a scripture memory song. It feels like music. This is a resource I highly recommend. Disclosure (in accordance with the FTC’s 16 CFR, Part 255: “Guides Concerning the Use of Endorsements and Testimonials in Advertising”): Many thanks to Seeds Family Worship for providing this CD for my family's use. Opinions are 100% my own and NOT influenced by monetary compensation. I did receive a sample of the product in exchange for this review and post.